Thinking back in time, Kärt came to my studio not as a client but a friend of my client’s without any intention to buy or order anything. Despite the modest beginnings, Kärt has become one of my main clients who has ordered more than several wallets, cases and a handful of armlets in addition to a bag. The world of designers and architects is relatively black-and-white, grey is the king of colours and one can say half-jokingly that the favourite accent of the most outrageous among us has become natural brown. All this holds true in Kärt’s case. As she is an interior architect by profession, she is usually the lady in black but she is becoming more and more intrigued by brown hues which is why there were no doubts about the colour scheme for the bag. Kärt herself says in hindsight that she might have been suffering from delusions of grandeur when deciding on the capacity and choosing the handles for the bag. 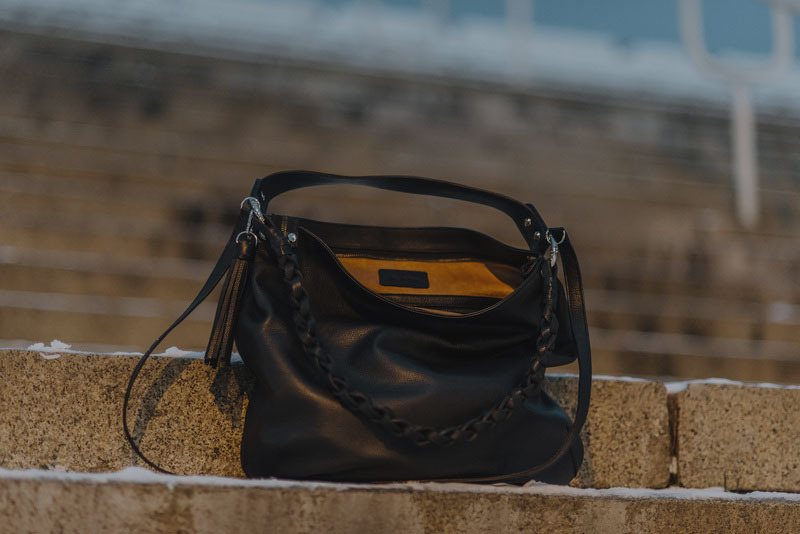 However, her indulgence turned out to bring her great enjoyment because she can fit almost everything in her bag and the otherwise modest black handbag is not so ordinary anymore if you look closer at the braids, tassels and handles which are attached to it. Furthermore, I have to secretly admit that both me and a number of my friends think that we all need a similar bag because it is a “come what may” kind of a bag – it is casual enough to go with jeans but also vain enough to join you for an impromptu party! Me and Kärt never judge each other when one of us does not reply to an e-mail fast enough and always understand when the response arrives unexpectedly quickly considering the time of the day. „I’m really busy“ has become a staple introduction in our correspondence but fortunately we both tackle hectic times with passionate enthusiasm and smiles on our faces. With this snowy blog post, I’m sending my greetings from home to Kärt in Rome where she escaped from the dark and cold Estonian winter. For a few years now, she has been living in Italy for a month or two in the beginning of the winter to work and charge her batteries in the sunshine accompanied sipping cappuccinos and nibbling on bruschettas followed by a sneaky glass of limoncello so she could dazzle again when she arrives back in her home environment and develop the coolest interior design projects! The credit for the architectural photo shoot goes to the photographer Tõnu Tunnel! Kärt’s everyday work is related to the design studio Form.